September is Newborn Screening Awareness Month! Throughout the month of September, Baby's First Test will be sharing newborn screening facts, videos and stories through our Facebook, Twitter and Instagram channels as well as highlighting education and awareness efforts from communities and organizations across the nation. To help amplify your voice, we encourage you to use #2018NBS when you share a post, picture, or story. We hope our materials and resources are useful to you in your awareness efforts! To download a PDF of the social media toolkit, click here. 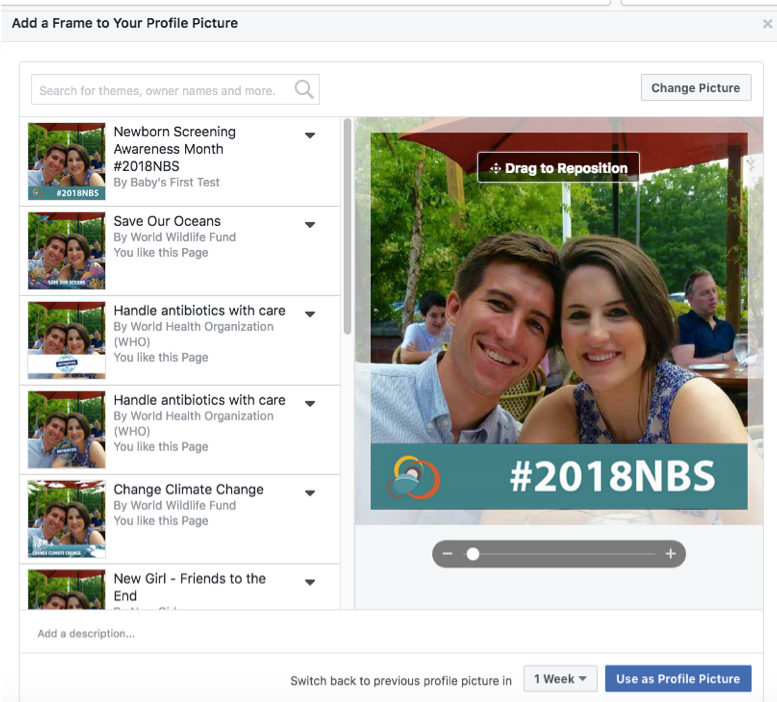 Add a frame to your Facebook profile by searching for #2018NBS, or trying it from Baby’s First Test’s Facebook page. You can choose how long the frame is displayed. Newborn Screening Awareness Month is a great time to tell your story and raise awareness about newborn screening. 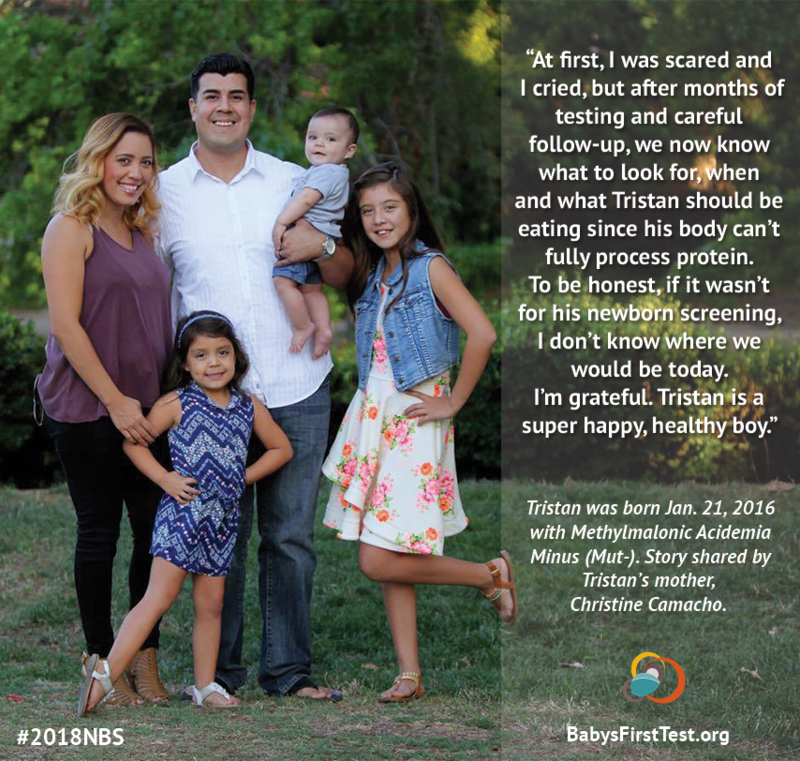 Throughout the month, Baby’s First Test will be sharing stories and photos from families and individuals about their personal experiences with newborn screening. These stories will be collected through our Family Experiences page. You can submit your story here. Include the basics. Who, what, when, and why. Be authentic. Everyone’s experience may be different; tell your truth. Use images or video. Photography is one of the simplest and most powerful ways to tell a story. Choose one story to tell. What’s the goal for telling this particular story story? Remember to tell a story that speaks directly to your goal, and remove any unnecessary details. Keep it short and sweet. Aim for 250 words or less. Include a call-to-action. What’s the goal for telling your story? To raise awareness? To advocate? Make sure to end your story with a call-to-action. How are you raising awareness about newborn screening? To let others know what you are doing throughout the month, email jackie@babysfirsttest.org.